COX Architecture has revealed its design for the redevelopment of Rod Laver Arena, part of the A$338m second stage of the Melbourne Park redevelopment. The redevelopment of Melbourne’s major indoor arena will includes four ‘pods’ (annexes), one of which will become the main public entrance to the arena. The upgrade, being undertaken by builders Lendlease, also includes new food and beverage outlets, upgraded bathroom facilities, increased disability access and a re-skinned facade.Other elements of the redevelopment will see rigging facilities and the Arena’s loading bay revamped and automated retractable seating will be added to increase efficiency and flexibility of the venue. First designed by COX Architecture in association with Peddle Thorp and opened in 1988, the venue is internationally famous for hosting the main fixtures at the Australian Open. 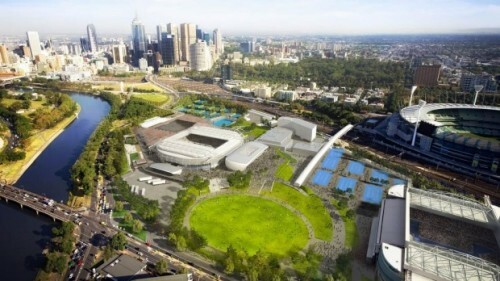 As part of an overall redevelopment of Melbourne Park, the key objective of the redevelopment is to increase the flexibility of the legacy venue, which was primarily created to host tennis generally, and the Australian Open specifically. Principal Director at COX Architecture in Melbourne, Patrick Ness, said Rod Laver Arena was one of the hardest working venues in the world in terms of the number of events it hosts. One of the key elements that informed the design was therefore the need to facilitate this. It’s a bit like performing heart surgery while the patient’s still awake. We’ve got this venue working and we have to do all this work around it. Ness also advised how the venue is able to switch between tennis- and entertainment mode, although currently, visitors attending a concert must wait in the concourse before going into the performance area. In the future, the new pods will provide a space in which to have dinner or drinks. During the tennis, the eastern annexe becomes an exclusive club for the players and will include change rooms and other amenities. The improvements planned will be the most significant to take place in the history of Rod Laver Arena. The back-of-house upgrades will allow our promoters and hirers to bring bigger and better shows to the arena, while the overall event experience will be greatly enhanced for our patrons. The refurbishment is part of the second stage of the A$700m redevelopment of the tennis facilities that make up the Melbourne Park sports complex and is the first major work to take place at Rod Laver Arena since it opened in 1988. Stage one of the redevelopment included an upgrade to Margaret Court Arena by NH Architecture and Populous. The redevelopment of Rod Laver Arena is scheduled for completion at the end of 2019, in time for the 2020 Australian Open. Images: The Rod Laver Arena redevelopment by COX Architecture (main image, top) courtesy COX Architecture and the Melbourne Park site (above). Representatives from both COX Architecture and Populous will be speaking at our Stadia & Arena Asia Pacific event in Japan next week. If you haven’t already secured your place, then make sure to do so now at: www.SAEvents.uk.com and join the 1,500 industry professionals that are expected to be in attendance.